Google Sites is a structured wiki- and Web page-creation tool offered by Google as part of the G Suite productivity suite. 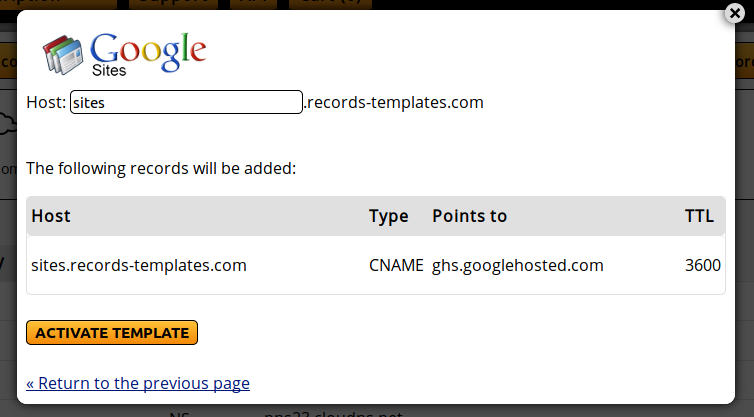 One of the easiest ways to use our services and Google Sites is using our Records Templates. They allow you to create the necessary records in your Master DNS Zone. From the orange boxes, click on "Google Sites". When you click on the "Activate template" button the template will be activated and the records will be added to your zone. You can edit those records afterwards.